Remote control car with sound effects! It&apos;s the all new Magic Tracks Turbo RC! The amazing racetrack that can bend, flex and glow as the remote control car goes, goes, goes! 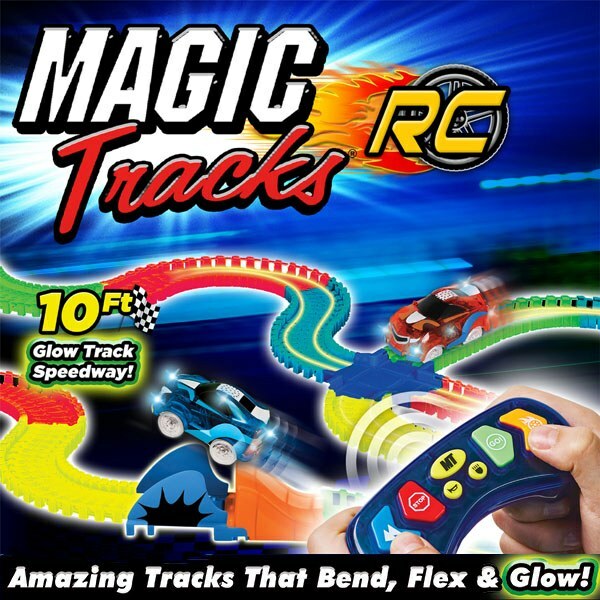 Just snap any track pieces together and create your customized speedway that moves like magic. Grab the remote and press go. The car burns rubber and zooms around the neon colored track. You can slam on the brakes, shift into reverse, honk the horn and more! Here&apos;s the best part - press the turbo button and hold on as the car accelerates full-throttle, blasting to the finish line! Serpentine technology allows Magic Tracks to bend, flex and curve into almost any shape or pattern. The remote control gives you seven extreme functions - Go, Stop, Turbo, Reverse, Flash, Lights and Horn. Send your car speeding over ramps, block other racers, zip around turns, even to turbo mode!